As if fluency in both English and Japanese wasn’t enough, Gakuji Tozaki has used a different type of skill as a means to positively express his Japanese American identity. 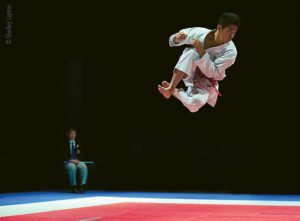 Through karate, the 26-year-old is aiming to represent the country of his birth in the land of his ancestry in the biggest sporting event in the world, the 2020 Tokyo Summer Olympics. Despite a self-described subpar recent performance at a tournament in Austria, Tozaki has a solid chance to compete in Tokyo for Team USA. Since winning his first National Karate Federation championship in 2013, he has remained in the top three in kata or forms — a solo discipline that consists of a formalized sequence of moments that simulate actual combat. That, and kumite or sparring, will join Olympic combat sports mainstays judo, taekwondo, fencing, boxing and wrestling for the first time despite karate’s extensive history. Based on the influence of southern China’s Fujian White Crane style of martial arts, kara (empty) te (hand) — a weaponless form of defense that emphasizes the hands, feet, knees and elbows — began in the Ryukyu Kingdom (now Okinawa) around the 14th century. Following the kingdom’s annexation by Japan in 1879, karate made its way to the country’s mainland in the early part of the 20th century. Although karate was introduced in Hawai‘i prior, Robert Trias opened karate’s first official school in Phoenix in 1946. Decades later, Tozaki’s parents Ray and Mayumi followed a similar migratory path from Japan to Columbus, Ohio before the family eventually settled in San Diego. It was here via an elementary school buddy that the then-9-year-old Gakuji was first introduced to karate. His first tournament at 10 was not one for his highlight reel. Eventually Tozaki’s desire paid off … in medals. When he was 12, Tozaki was good enough to make a traveling 120-member Amateur Athletic Union national team that competed in Tokyo. Despite going up against higher level black belt competitors, the then-brown belt earned two silver medals at the goodwill tournament and a bronze at the larger Dojo Senbatsu Tournament — one of only a handful of the traveling American squad to place on the podium in both events. In the years that followed, Tozaki won a treasure chest full of awards at the sport’s national tournaments, including one extremely successful run of eight golds and one silver in both kata and kumite when he was 16. In recent years, Tozaki, who graduated from the University of California, Davis in 2014 with a degree in exercise biology, began focusing solely on kata to perhaps lead him onto sport’s grandest stage in a land that holds deep meaning within him. “I remember when I first started with karate, my obachan (grandmother Misako Kasahara) taught me how important both education and martial arts were in Japan,” he said. “Actually both of my obachans stressed that and it’s stayed with me. Follow Gakuji Tozaki on Instagram at @gakutoro.